Most of us have had one or more of these cats: they are happy, sweet, maybe even affectionate on their own terms, but they simply refuse to sit in our laps. Allegra is one of them. It took months after I first adopted her at seven months of age before she would even come near my lap. She liked being in the same room with me, even sit right next to me, but my lap? That was off limits territory as far as she was concerned. After almost four years with me, she has just recently started to come around and is starting to ask for some lap time. Stephanie Bouchard can relate – to the point that she published a charming little book about the topic. The Lap-Reluctant Cat will make those of us with cats suffering from Lap-Reluctance Syndrome feel a little less alone. Bouchard captures the “syndrome” with humor and empathy. 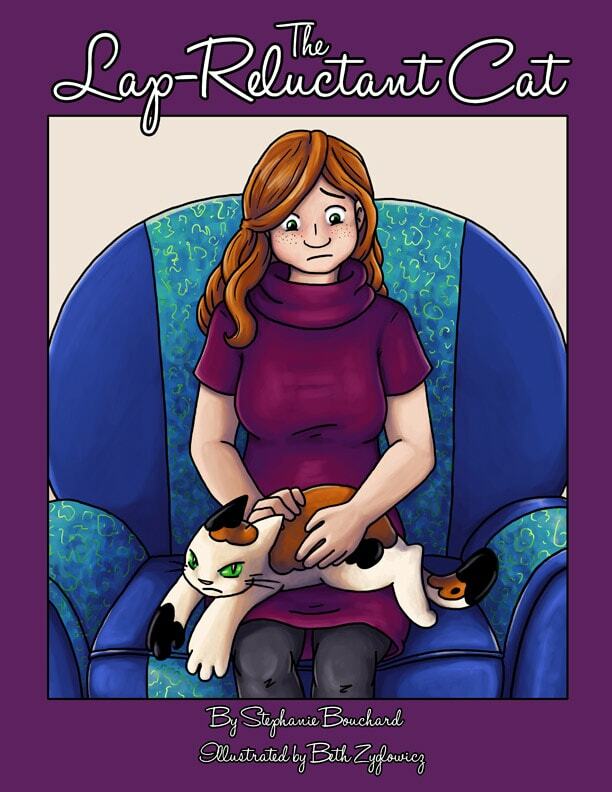 While I’m not sure the book will actually help you cure your cat’s LRS, it is guaranteed to make you smile from start to finish. I can’t decide what I loved more: the beautiful illustrations by Beth Zyglowicz or the witty captions by Bouchard. I think it’s probably the combination that makes this book the joyful, clever and oh so relatable book it is. If you have a lap-reluctant cat, or even if you just love cats with all their unique personalities and quirks, I promise you, you will thoroughly enjoy this book. Available from Amazon for Kindle and as a paperback. 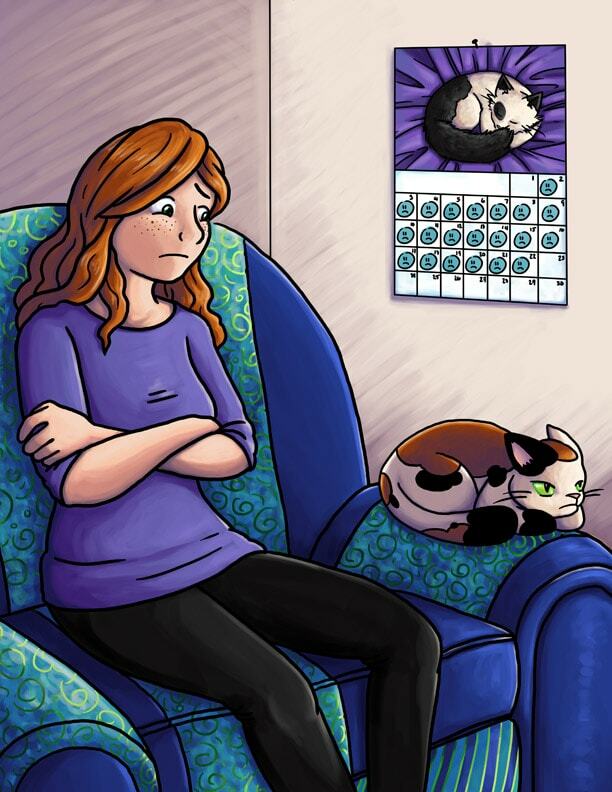 Do you have a lap-reluctant cat? How do you deal with Lap-Reluctance Syndrome? Thanks for the review. Sounds like a good book. Tubby does not sit with you or like to be held. He loves to be looked at on his own terms. Cashew & Garfield aren’t really either but; every once in awhile surprise you for a few minutes. Charlie loves laps. My kittens all are lap resistant. However they are very affectionate and enjoy being with me wherever I am in the house. A 4 share my bed by cuddling and curling up against me. I get lots of kitty kisses and rubbing. I adopted a 5 year old retired female Ragdoll queen, Ena, 8 months ago. She does not do laps, does not sleep with me, hates other cats and seriously balks at grooming and any other attempt at ‘futzing’ with her diva-ness. She has a powerful left hook which, thankfully, she seems less interested in deploying to my face of late. (Fortunately, the swats have been sans claws so far.) However, she loves to be around me or know where I am at all times, rubs on me, purrs, kneads nearby soft surfaces, rolls on her back and solicits and enjoys petting. She is clean, quiet and respectful and scratches only her Brawny cardboard furniture. She adores her multiple daily sessions (obsession?) with DaBird. Ena is unlike any cat I have previously known. She is the first that has not slept in my bed — she does not even care to sleep in the same room. She is a mysterious mix of aloof and sweet with a streak of demanding diva thrown in. Her detestation of the comb has resulted in one large mat that will now need to be shaved off. Perhaps living the first 5 years of life in a cattery does this to a cat. Perhaps she often sees me, at times, as just another large cat who needs to be kept in line. But she is at last now free of cages and the stress of being around multiple un-related queens she mostly hated. She was one of the smallest queens but she was the alpha. She is clearly relaxed and very happy here. She may even be slowly ceding the role of alpha queen to me. We are working on it. It sounds like Ena found the perfect home with you, Patty. I bet that she will gradually relax more and more as she gets more comfortable in your home. Hi Ingrid! I definitely have to listen to this book! I hope it’s available on CD or on audible! Rajah will absolutely not sit with me for more than two minutes. He never voluntarily comes and sits in my lap. He’ll sit next to me and he lets me pet him, but he won’t sit in my lap. I would love it if he did. I love him to pieces, but it would be nice if he liked to cuddle. He’s three. How are Ruby and Allegra? I have to get this book. Truffles will come to my lap for about 5 minutes and then leaves…seems uncomfortable for some reason even though she’s so small and fits perfectly. wish it was in paperback form. . .
Diane, it is available as a paperback. My Cats are the opposite. They set in my lap in the most awkward positions. The 2 Cats are brother and sister and it seems they fight for lap space. Just like 2 little kids. But there is nothing in the world I’d take instead of my Cats.